Hong Kong carefully and constantly educates all of us seven million residents on how to live in a bunched up area without annoying each other to death. As a result there are many, many rule boards. 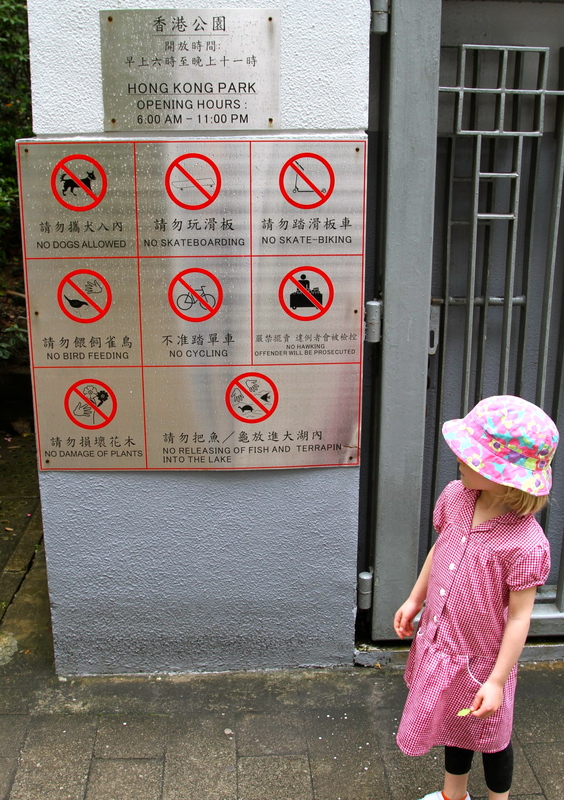 In the face of all of these restrictions, we Hong Kong residents do our best to comply. When someone breaks these rules (or rather, the ones we deem important), we immediately identify him as an “outsider” and shun him with our body language and icy stares. One of the most important rules in Hong Kong is to allow passengers to exit the MTR (subway) car before boarding. 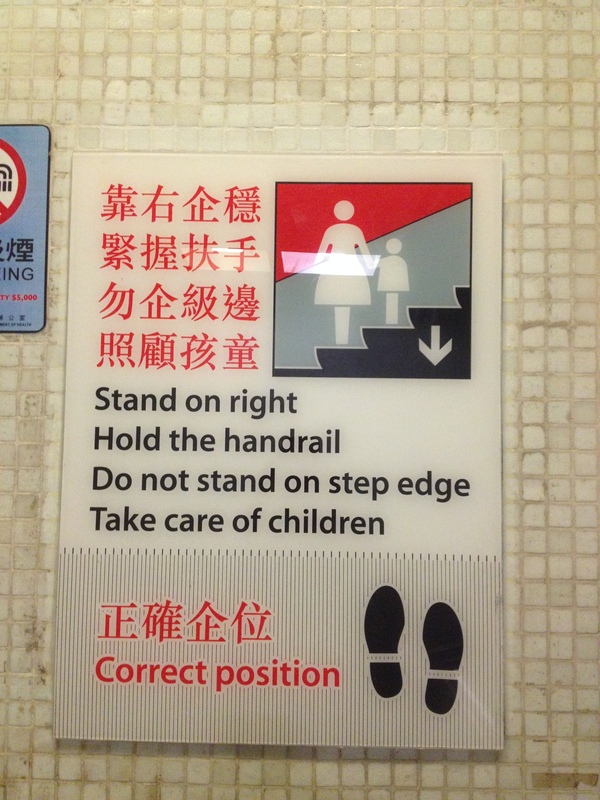 This rule is announced repeatedly in three languages — Cantonese, Mandarin and English — throughout the MTR system. Arrows and lines are painted on the floors to further remind the populace of proper boarding etiquette. 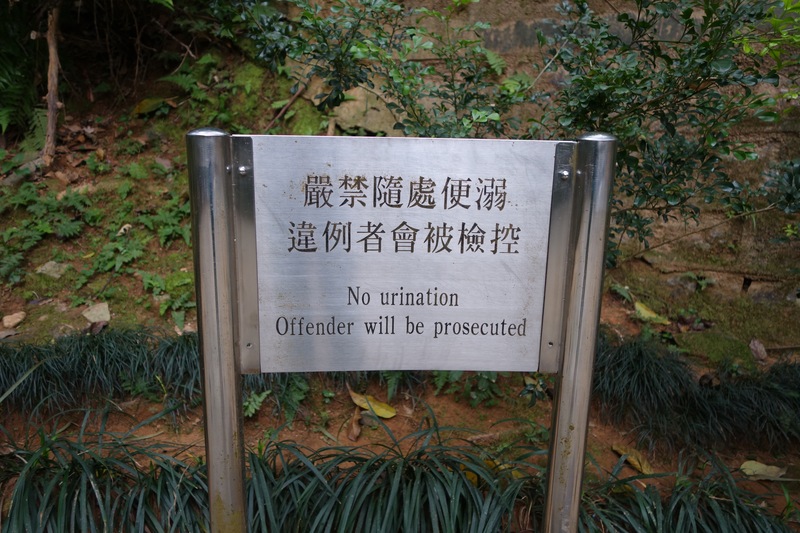 This is a rule that Hongkongers mutually agree must be followed to the letter. So when I saw a group of four twenty-somethings waltz straight up to the MTR carriage doors, both cutting in front of many other queuing passengers and also blocking the exit of those wishing to get off of the MTR, I gave them my most hellish, demonic stare. As we boarded the carriage, I chose a position close to them. Just who did these people think they were flaunting the sacred MTR rule? They were ethnically Asian, so at first I thought they were possibly mainland Chinese, but something about their body language wasn’t right. I scanned them more closely. Their clothes were terribly fashionable in an understated way, they had perfect hair and were all wearing sunglasses indoors. The man was wearing loafers without socks. Very likely not American then. Possibly Korean? This was my next guess solely because I have the general idea that Koreans are cool based on absolutely nothing. I moved in even closer to identify their language. Confirmation once again that no nationality has a monopoly on the production of oblivious tourists. 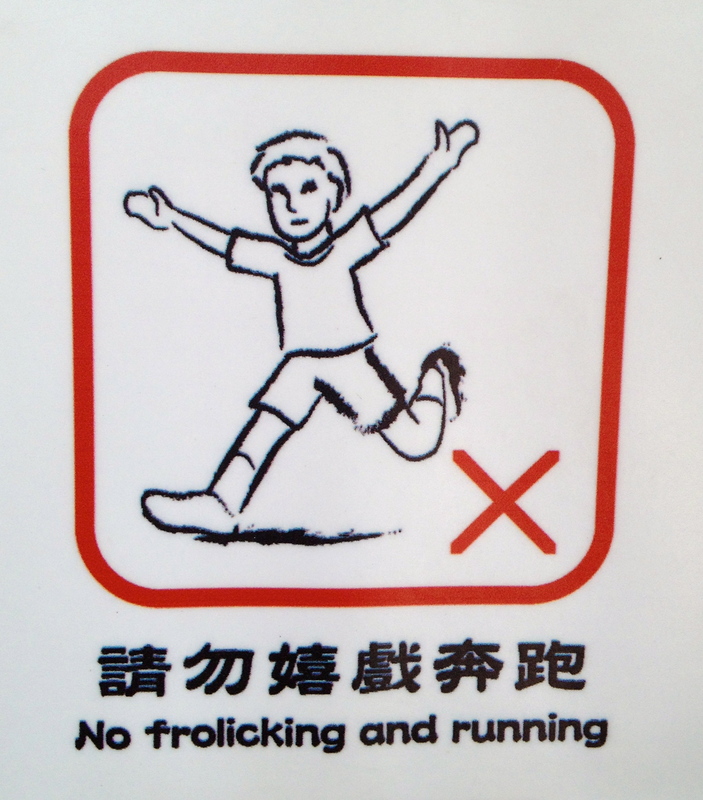 Visitors, if you’re going to break a Hong Kong rule, go frolic in the Nan Lian Gardens, but for God’s sake follow the MTR boarding rule. It’s the only thing that separates our civilization from complete anarchy. Hilariuos and brilliant! Love it!!!! I think the time is ripe for a prankster to start posting rule boards around this city! 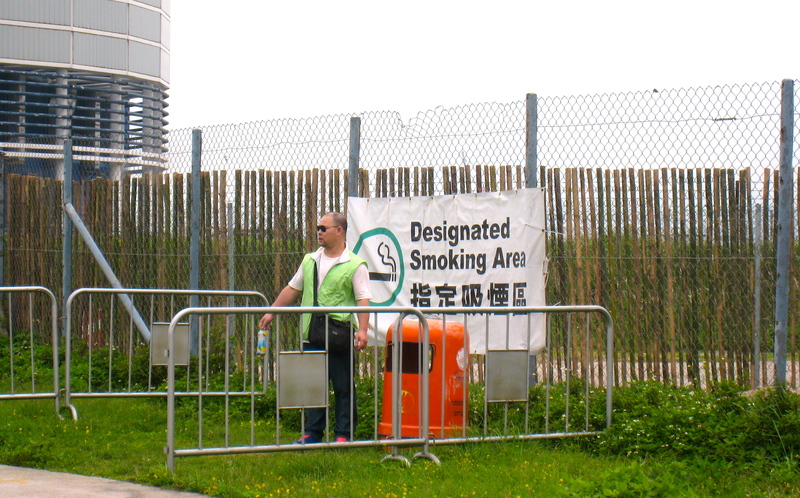 Is one required to wear a fluorescent jacket while smoking…? If that guy is doing it, it must be in the fine print of the regulations. Either that or I’ve completely missed this season’s trend. I really need one of those big telephoto lenses so I can discreetly capture all of these special moments from a distance. The problem with evil stares is that, like British tutting, they’re only understood by the people who already know the rules. People who don’t? They need something a little more obvious. Like words or something. Because they haven’t a clue what the rules are. You’re absolutely right. All the words around them didn’t seem to clue them in, so my icy stare did nothing either. Next time perhaps I’ll have the gumption to speak up. I wish I could post a picture here – it is of my favourite rule sign ever. On the side of an old tower block in London where I used to stay someone had replaced the ‘no ball games’ sign with a perfect replica that read ‘no mind games.’ I thought it may get taken down but a year later it was still there! This is so perfect! I must now think of my own replacement signs! I must say, the Spanish are quite good at breaking social rules in London, too. They come here to shop, mainly in Primark, but also at Camden market where they stand in large groups blocking the flow of people. I once gently rested my hand on a girl’s shoulder in order to get by her and she looked horrified at me. Perhaps horrified looks are the way to go? I’ll go with an exaggerated look of horror next time! It’s quite a different scene at the Inspiration Lake versus the government regulated parks. Also, at the Western District Public Cargo Working Area. The worst rule makers are certainly the LCSD! What is at the Western District Public Cargo Working Area? This is a great tip! Thank you Alan. Practiced my “kill face” on bus 307 today when a noisy group sat near me. Worked a charm. This is great. So have you seen those crazy pectoral signs near mountains showing in a story board way all of the things that can go wrong near a mountain? I love those. Will try to dig one up if you haven’t. As to the MTR rebels, maybe time to call out Red Banner Sister? Not pectoral, pictoral. GD auto correct. I wondered a second about this strange body-building mountain hidden somewhere in HK and then my brain made the auto-correct leap! Red Banner Sister would have certainly dealt with the MTR situation better than me. She probably would have made them wear dunce caps and paraded them around the MTR station inciting other passengers to denounce them. 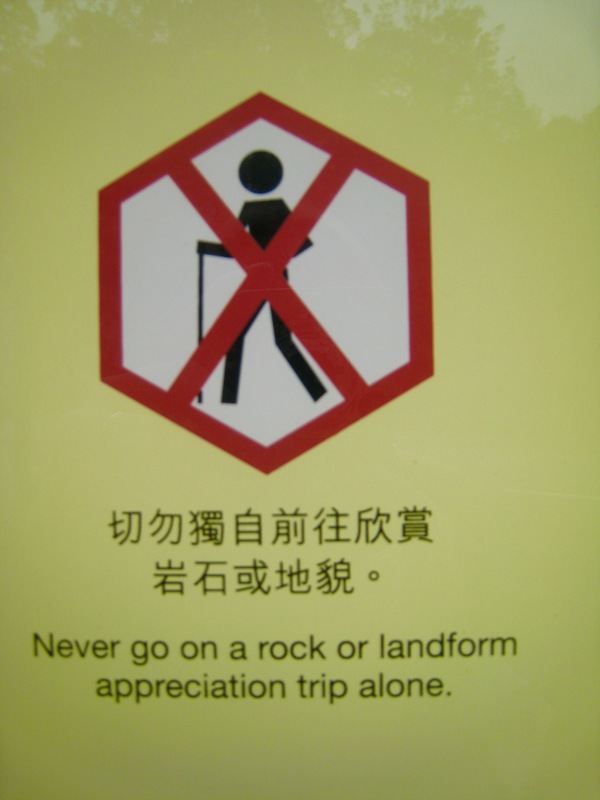 I think the rock formation appreciation warning may have had a bunch of other warnings nearby it. But I don’t have a picture! Do share! All this time riding the MTR I’ve only see one rule broken, and that is some guy EATING a pork bun in the broad daylight on a weekend before a hike (he was dressed like he was going hiking). No amount of evil staring could get him to put the food away. And he was a Hong Konger! PS: We had a woman at work who squatted on the toilet bowl, slipped…because toilet bowls can get to be “wet”, hit her head. Let’s just say the ambulance had to be called. HEED THE SIGNS! They are necessary, I assure you. I salute that hiker and his MTR rule breaking. Maybe I’ll bring a pork bun along on my next ride. I do not salute the lady who stood on the toilet seat. 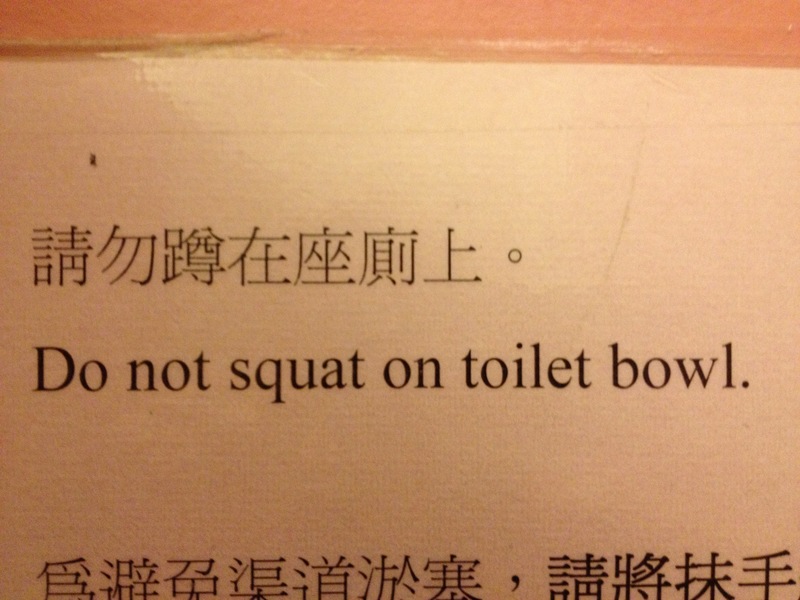 If you’re that worried about germs, you’ve simply got to develop the thigh muscles to hover (or locate a squat toilet).